It has been a while, hasn’t it. I was having paint withdrawals. I’m better now, got a couple of pieces set out on the drop cloth all set for tomorrow morning. 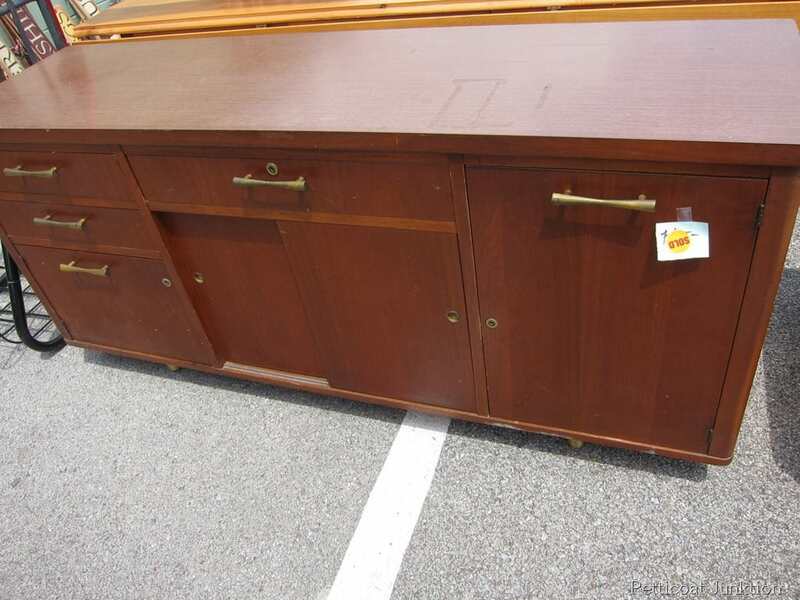 I think this is an office piece known as a “credenza”. In fact my boss has a similar looking one in his office. It’s solid wood and very nice….. just a little plain looking. I went back into my old picture files and believe it or not I purchased this piece at the Nashville Flea Market in April of 2012. It’s been taking up space in my workshop. 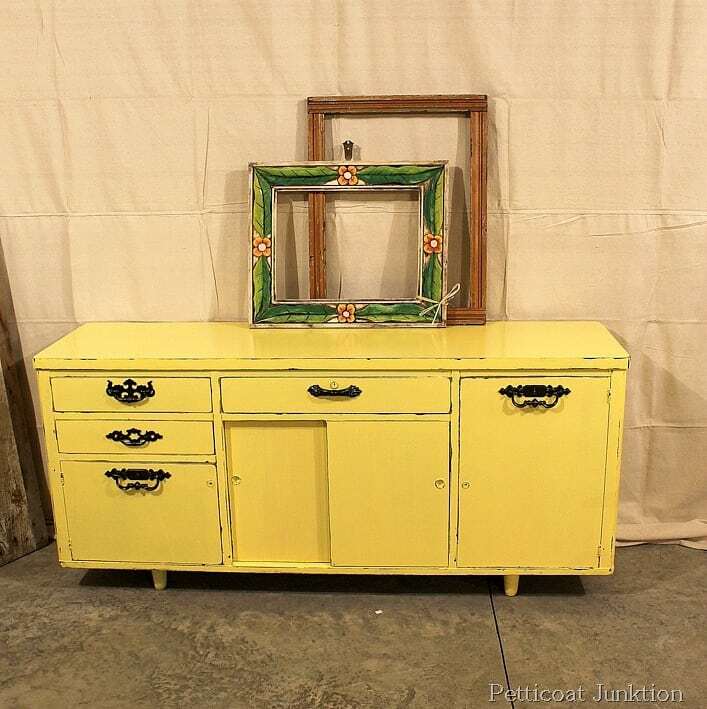 What happens is that I buy furniture to paint and I just keep piling it in, on, and around other pieces….. so whatever is the easiest to get to is what I paint next. That tells you I am getting low on furniture. I decided on a latex paint so I primed first with Glidden Grey Gripper. 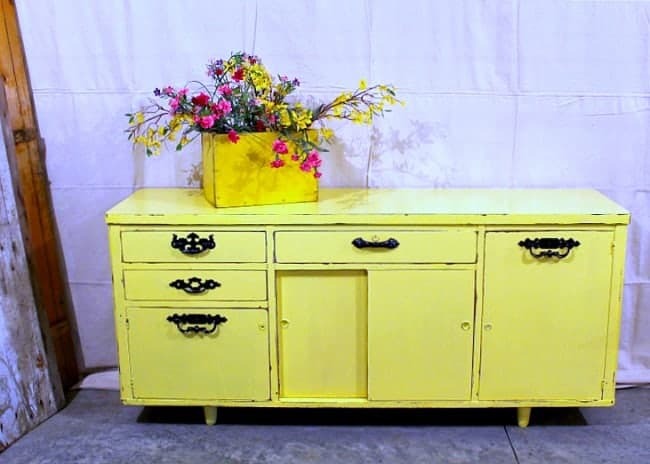 I painted a china hutch called “Sunny” in a bright cheery yellow and I used the same paint for this makeover but added a little white to lighten it up a bit. You guys know I’m always mixing things together. Have to keep things interesting. I spray painted the original hardware white but after looking at it against the yellow I decided……no. 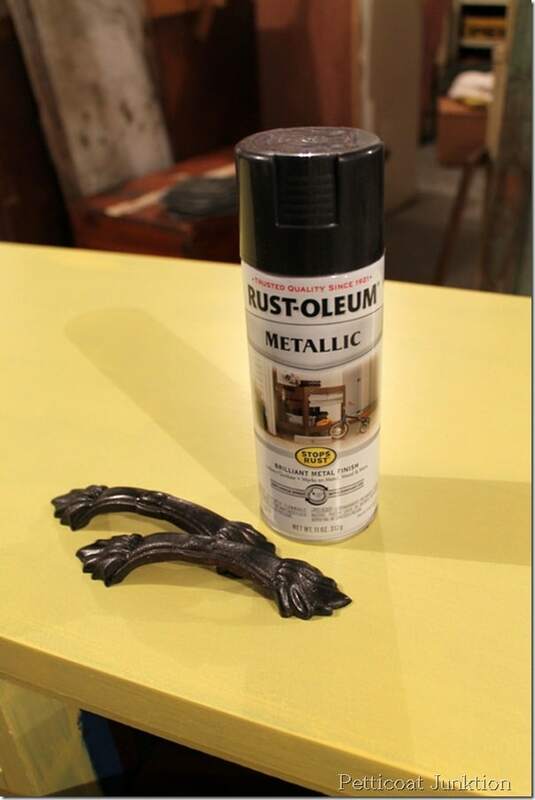 I pulled out a can of Metallic Rust-Oleum in Black and also searched for different hardware in my junk stash. The different hardware and the black metallic paint really pop. The original hardware was just too plain. I also did a little light distressing. Not drab office furniture anymore. 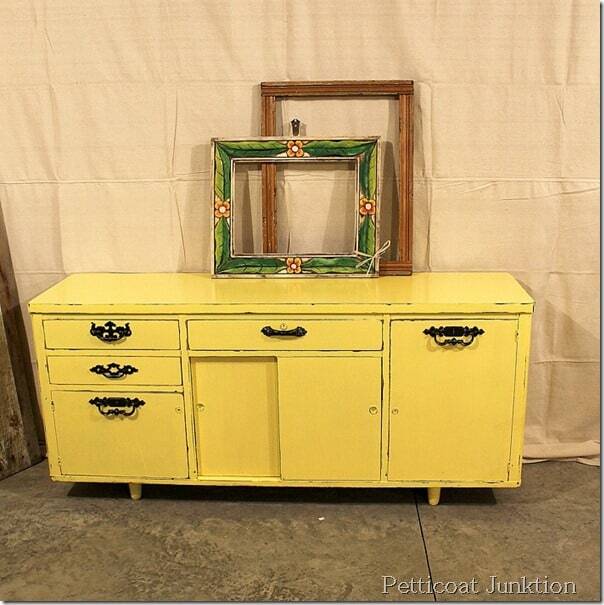 Perfect for a flat screen tv….foyer catch-all…..dresser…..you name it! Love this! 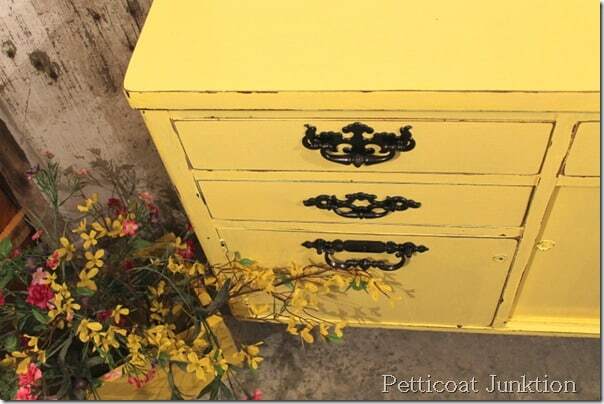 What brand and color paint did you use? AWESOME!! !Absolutely love this! 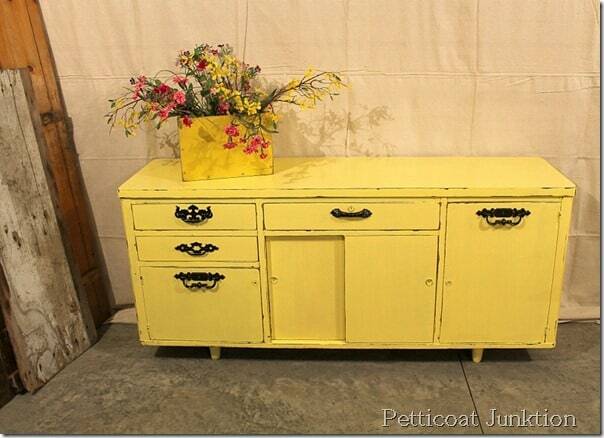 love the yellow color and you PERFECTLY distressed it!! 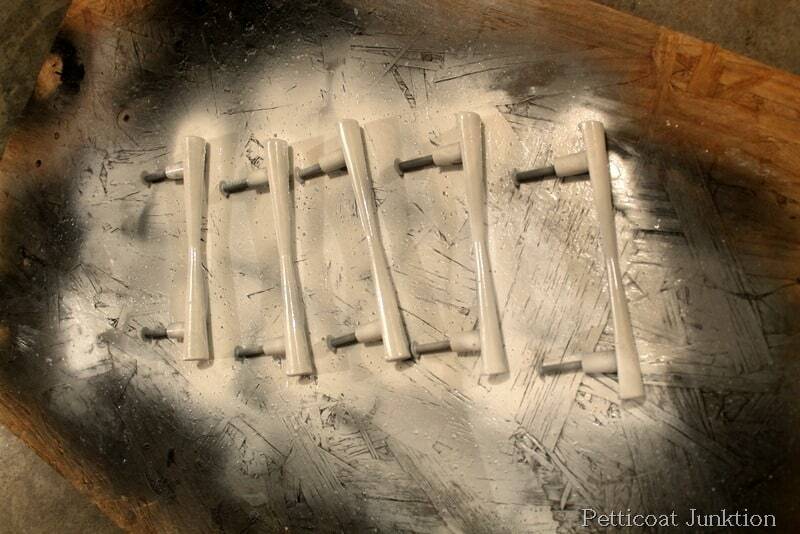 A lot of people I have seen go wayyyy over board on that and using different handles or whatever is in your stash [and now I can show hubby WHY I need to buy more handles!! Ya never know when you need ’em!!] thanks for a great tutorial!! Happy to feature you at the party this morning! Thanks so much for joining us! Featuring this tonight! I adore it – looks great! The yellow is perfect! 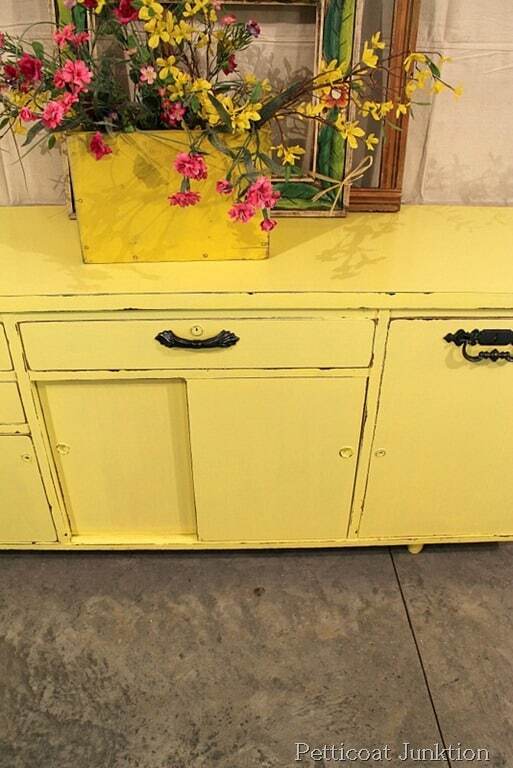 I love the yellow and the fun mix of pulls! 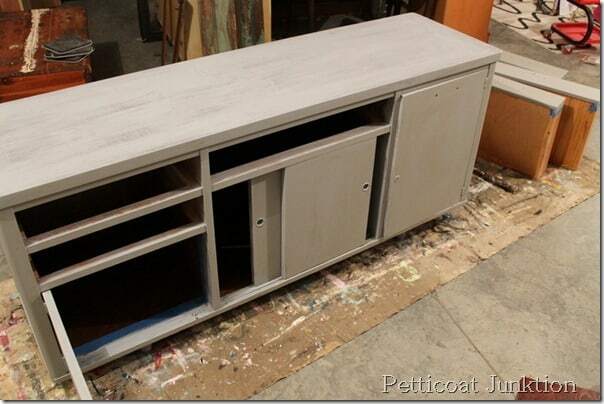 This would be a perfect media cabinet! Thanks Sharon, I think it would be great as a media cabinet too! I have such a soft spot for yellow furniture and this one is no exception – it’s so cute. I love just the little bit of distressing….you wouldn’t think that it started out as plain and boring as it did! Good choice on the hardware! Thanks Kelly, I like the hardware as well. 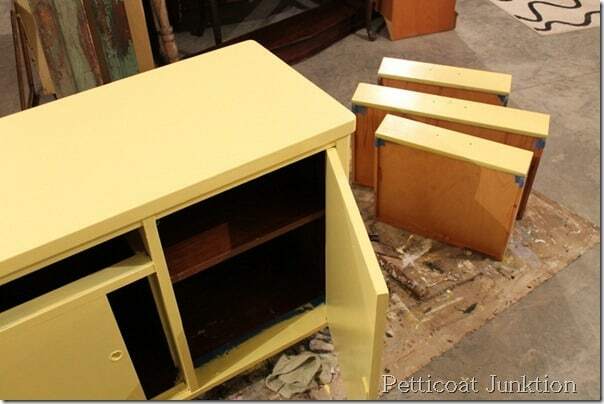 When I took it to the shop to sell I started to open one of the drawers and the pull broke apart. I thing it must have been cracked a little. Now I have to find another piece in my stash to spray paint. These handles have the 4″ centers or whatever the term is where the screws are 4″ apart so they are harder to come up with. OMG, I love this! You did an awesome job! Kathy, I love it! The black is much better than the white! Good choice. 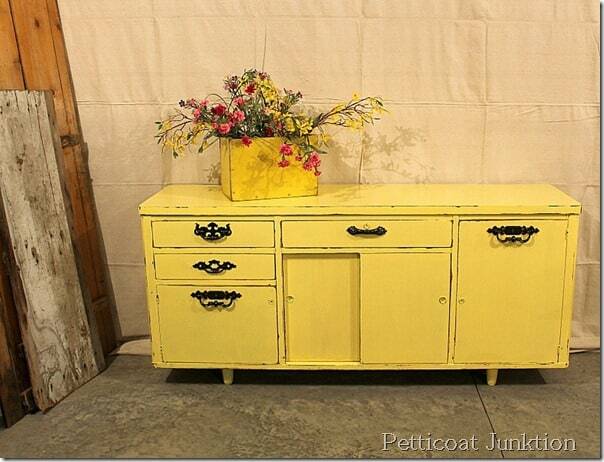 I really love that yellow!!! What a cheerful burst of sunshine! It is a bold choice and I LOVE it! Happy Thursday from the enchanted oven. I can’t believe that’s the same boring old brown office furniture in the picture. You’re amazing. The color is great and I love the black handles..I think it’s awesome. Thanks for sharing your great ideas. thanks Kathy, Hope you are enjoying Florida, I think about you! This is the first time I have commented, but love to read your blog! This piece is perfection! I love that every handle is different! Wish I was closer and had somewhere to put that piece, it would be mine! Beautiful! Your pieces always look great and inspire me to try it myself. thanks Shelly. Most of my makeovers are really easy! I disagree with the above comment. The hardware you used on this piece makes it pop. 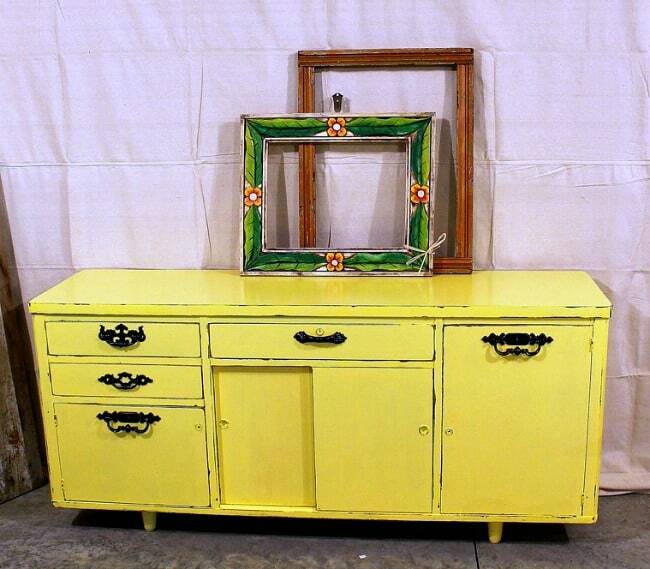 I love this piece and the color yellow. Thanks Ellen, I can see her point but I wanted it too be a little quirky instead of matchy-matchy. it is a nice piece still. thanks Svietka, I definitely see your point. I just wanted something a little different. thanks for following my blog and for the comment.